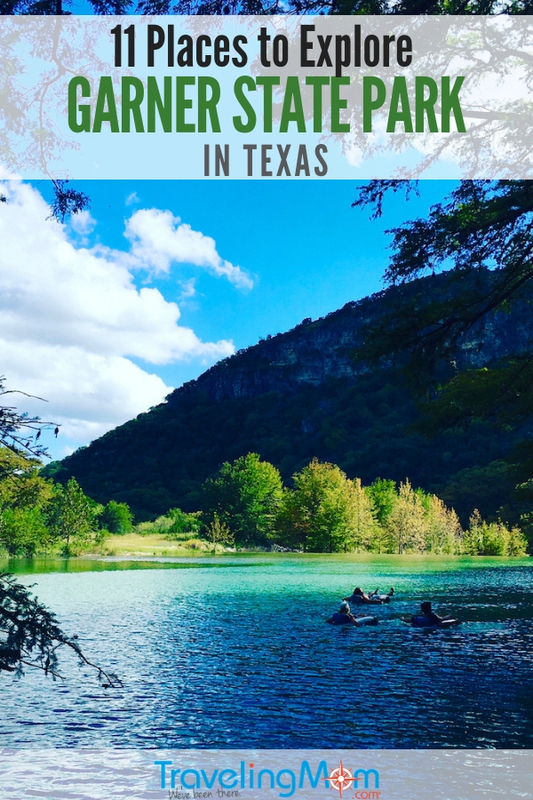 Garner State Park in Texas is a bucket list destination for many Texas families for summertime camping getaways and Frio River float trips. Since the temperatures warm up early in the spring and stay warm through the fall, Garner State Park offers a laid-back getaway during the shoulder seasons too. When planning a trip to Garner State Park, explore Concan, Leakey and Utopia, tiny towns just a few miles from Garner State Park. From the wildflowers in the spring to the fall color season, this area offers three seasons of outdoor activities, in-and-out of the Frio River. 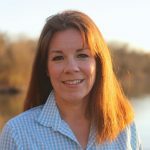 Read on for where to go around Garner State Park from the National Parks TravelingMom, who is a Texas native. With warm temperatures in the fall and spring, the Texas Hill Country River Region offers a picturesque weekend getaway. Enjoy the best of the Texas Hill Country River Region shoulder seasons with a weekend getaway to see some fall color or spring wildflowers. Since it’s still warm enough to tube on a sunny Saturday afternoon, I grabbed a tube and took a drip in the Frio River. Don’t be intimidated its name; it’s more refreshing than cold. Then explore the area around Garner State Park for more fun. A Texas favorite for generations of families, Garner State Park is a bucket list state park everyone should visit. Better yet, make it a weekend trip and camp. Dedicated in 1941, Garner State Park was named after Jack Nance “Cactus Jack” Garner, the Vice President of the United States from 1933-1941. It features 1,774 acres with activities like playing miniature golf, hiking or floating along the Frio River in a tube or kayak. Developed by the Civilian Conservation Corps (CCC), Garner features rock buildings and cabins built by the CCC. The CCC was created by President Roosevelt during the Depression. The organization employed young men to build park infrastructure during the 1930s. Garner State Park offers 335 campsites, 37 screened shelters and 17 historic stone cabins for camping. Garner also features a playground, a butterfly garden with native plants and an interpretive center. The fun centers around the original park concession building that offers a souvenir store and a grill in an Airstream trailer. Under the shade of bald cypress trees, couples dance the night away on weekends during the summer season. And don’t forget to hike up Old Baldy, it’s a .5-mile hike to the top. Reward yourself with views for miles across the Texas Hill Country. Though it’s a bit steep so leave it for the bigger kids. Located 10 miles north of Concan, Texas, at 234 RR 1050, Garner provides 2.9 miles of Frio River access. Admission is $8 for adults and kids under 12 get in free. Don’t think floating the Frio is just a summer thing. Since temperatures warm up quickly in spring and stay warm through the fall, consider a tube trip almost any time. Rent tubes inside Garner State Park. Or find an outfitter, like Andy’s on River Road, that will rent you tubes then drop off and pick up your family for your float trip. Do something different, and explore the Frio River on a kayak. And teens love paddling around on a SUP, a stand up paddleboard. Andy’s Outfitters is located at 21488 U.S. Highway 127 in Concan. Ride a horse to help another horse. Offering pony rides along with trail rides through their majestic property, the Elm Creek Stables also operates the Frio Canyon Horse Rescue. All proceeds from rides go to feed and house the rescue horses located on the property. The horse handlers pair the perfect horse for everyone in your group. And the hour-long ride offers picture perfect hill country views. Located at 31611 N U.S. Highway 83 in Concan. Call ahead for times and reservations. No experience necessary. All roads leading to Garner State Park are scenic roads. Enjoy the scenery along U.S. Highway 83, then take a side trip to the town of Utopia along Ranch to Market Road 1050 (RM 1050). Or head north to Vanderpool, near Lost Maples State Natural Area. Travel Ranch to Market Road 187 (RM 187) for another lovely drive through the Texas Hill Country. Texas offers lots of natural beauty. Though the leaf peeping falls flat in Texas, since it offers a limited amount of dazzling trees, like maples, for fall color. So Lost Maples State Natural Area is a hill country favorite. Find the lost maples along with sycamores, bald cypresses, walnuts and several varieties of oak. Each will turn its own shade of beautiful during the autumn. Opening to the public in 1979, Lost Maples is a smaller park with just 2100 acres, including 30 campsites with electricity and 50 hike-in sites. Located on the pristine waters of the Sabinal River, it provides 11 miles of hiking trails. Located at 37221 FM 187 near Vanderpool, Texas, admission is $6 for adults and free for kids 12 and under for a day pass. Best way to remember your getaway is to buy a souvenir. Loca on the Frio features hard-to-find Texas duds. Stocked with unique boutique clothing, accessories along with framed art. Located at 23223 U.S. Highway 83 in Concan. Dora’s Nursery offers native Texas plants along with an extensive selection of yard art, both metal and pottery. Located at 1090 U.S. Highway 83 outside of Leakey. Frio’s Dry Fifty is a destination for souvenirs from your Texas Hill Country Trip. This shop meanders like the Frio River, offering everything from T-shirts to flip-flops. Find a vintage pink pickup truck outside. Located 21239 Texas Highway 127 in Concan. Head to nearby Utopia for an eclectic pair of restaurants. In a building built in 1904, the Lost Maples Café offers home-style breakfasts, like the kitchen sink breakfast taco. Or sample a burger or sandwich basket. And the pies are a dessert lover’s must. Find homemade apple, cherry, and the meringues—chocolate, coconut and lemon – along with local faves buttermilk and pecan. Located at 384 Main St. in Utopia. Open every day from 7 a.m. to 9 p.m. The Laurel Tree is a Saturday treat with a seasonal and locally-sourced menu by Chef Laurel Waters. Waters, a French-trained chef with culinary experience from Provence, blends French technique with Texas tastes. Make it an evening by enjoy a leisurely meal in a picturesque dining room. It’s BYOB for wine. During my visit, I enjoyed Brisket Wellington, a Texas twist on the Old English classic. Tender slow-cooked beef brisket is wrapped with flakey, golden puff pastry and oven baked. Served with seasonal vegetables cooked to tender, colorful perfection. The Laurel Tree is open for lunch and dinner on Saturdays only. Located at 18956 N. 187 in Utopia. Frio Float fixes the afternoon sugar slump with candy confections of every color. Then grab some old-school candy for the ride home with an impressive selection, sold by the pound. Also find ice cream treats in this colorful addition to Concan. Located at 21563 Texas Highway 127 in Concan. Sometimes in Texas, gas stations offer crazy good food. Concan General Store offers the gas and the basics for your camp-out, just as you’d expect. But the house-made chicken salad sandwiches are a treat. Get thick homemade bread with chicken salad so good it could take center stage at a baby shower. Located at 23269 U.S. Highway 83 in Concan. Stripes Convenience Store is another hidden treasure for its Tex-Mex food, especially the breakfast tacos. Located in the back of Stripes, find Laredo Taco Company. Located across Texas, and at 2815 East Main St. in nearby Uvalde. Don’t let the fun die after dragging the tube out of the river. Find several places in the Concan area offering live music. House Pasture Cattle Company offers a line-up of Texas-sized acts at the outdoor venue. Find a covered dance area surrounded by picnic tables and a grassy area. Indoor bar. Located at 2 River Road in Concan. Gates open at 5 p.m. with shows starting at 9 p.m. Live music spring through fall, most weekends. All ages venue. The Historic Leakey Inn features live music on Saturday nights. Make it an evening with house-made soups and sandwiches. Beer and wine available with indoor and outdoor patio seating. Located at 527 S. Highway 83 in Leakey, north of Concan. Open Thursday through Saturday from 11 a.m. to 10 p.m.
Garner State Park’s concession building is the place to dance under the trees. Since the 1940s, the Saturday night dances are a regular to-do from spring through fall on popular weekends. Cabins are sprinkled through the Texas Hill Country River Region. Though the historic cabins at the Garner State Park are a local favorite. Built by the Civilian Conservation Corps during the Depression, the cabins offer rustic charm, some with fireplaces. Bring bedding and everything you need to cook for your getaway. Cell service is spotty at best. So pick up an area map at the Uvalde Visitor Center at 21170 Highway 127 in Concan. Reservations for popular summer weekends book up ONE year in advance for Garner State Park. Camping is limited in Lost Maples State Natural Area so reserve in advance for the fall color season. Weekend leaf peepers need to be at Lost Maples when the gates open on the weekends. The park closes when capacity is reached.